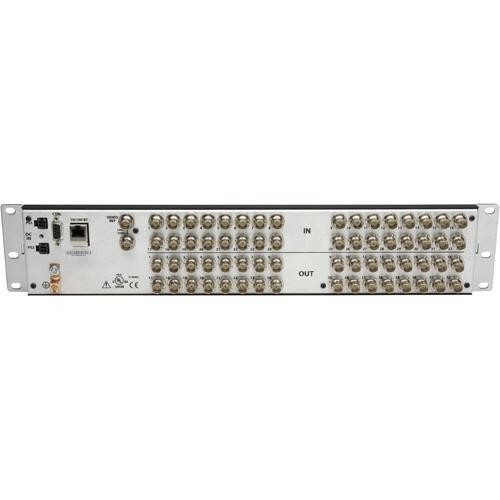 The NVISION 2 RU 32x32 AES Digital Audio Router from Grass Valley operates in either synchronous or asynchronous mode, and is Dolby E compliant for phase accurate multichannel audio. The asynchronous router allows easy interconnections when different audio sample rates are present, as with desktop audio production using 44.1, 48, 96, and 192 kHz audio formats. The optional NVISION Compact router control panel system is scalable, and allows up to four routers to be controlled from up to 16 remote control panels without the use of an external controller. The routers can be remotely controlled and monitored via a serial connection and over Ethernet, using NVISION protocols or other third-party control software. When integrated with the NVISION's routers, it offers full complement of user interface options, easy-to-use Java-based configuration editor, a choice of several core system controllers, and a wide variety of highly configurable hardware and virtual control panels. The included Java-based CRSC (Compact Router System Configurator) software can configure IP settings, partition routers into multiple levels, program remote control panels for device level control, build salvos, and reconfigure large routing networks to meet changing facility workflows. Configurations can be devised offline, and easily uploaded over a network to the system. The Configurator has simple help screens and menus to guide users through each step.